General Information: Very popular and well-known perennial, grown for its always showy, sometimes fragrant flowers. Heights vary from variety to variety but most are 60-90 cm tall and will quickly form a large clump. Long-lived, very hardy, preferring full sun or partial shade and well-drained, fertile soil. Best staked with hoops in early spring as the heavy blooms will be quickly dashed and ruined in a heavy wind or rain. Single varieties are lighter and may do well with less support. 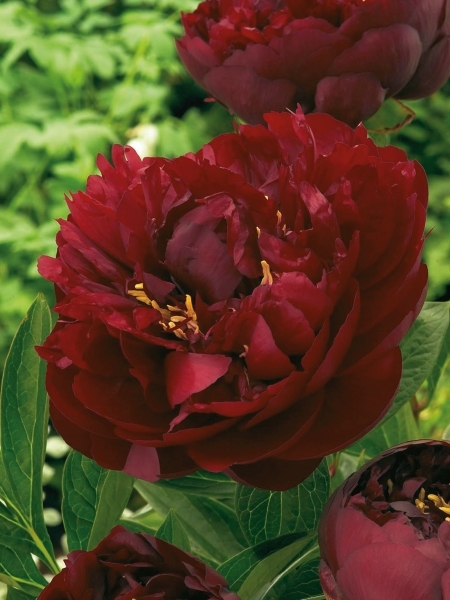 Do not plant your Peony too low as this will discourage flowering. A little bit of the plant's hard, tuberous root should be exposed above the soil. Superb cut flower. Most varieties bloom early -to-mid summer.